3/2/1 challenge. 3 patterned papers, 2 embellishments, 1 tape/ribbon. There is a Challenges section: should we be putting it there? I'll sign up, guess you, Ruth, and Di as well. I'm in, still to do Jan's but I will. yes , me please. Is it the same as before where we just have to put it up by the end of the month in here? and can i possibly be allowed to use washi isntead of ribbon? I think end of the month idea is the best way of doing these. And I have no objection to tape/ribbon choice. Yes Please, as we have untill the end of the month I think I should be able to put something together for this. heres mine then! 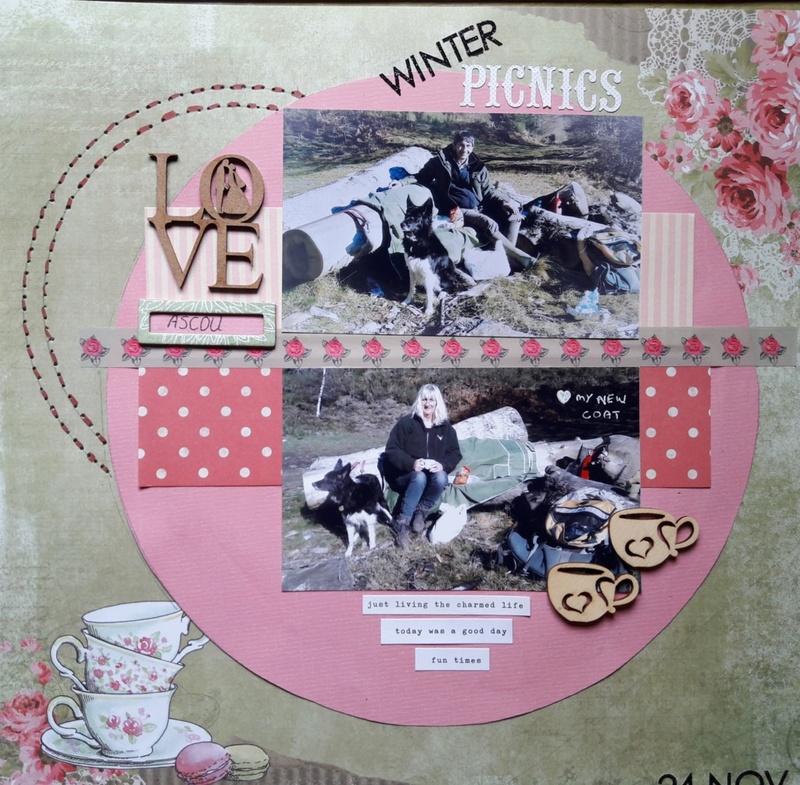 its nice to be scrapping again. That's gorgeous, was the paper pre sewn or did you do that? no, i did the sewing - the teacups were and right hadn corner were already on the paper. I did it form a sketch! That's smashing Maria. Very neat stitching. ha ha, as if!!! and er, not much tea in the cup either, wine more likely, though he does always take tea and the stove for me. That's great Maria, loving the embelishments too. Lovely Maria and I love the little teacups. Mine will be sis in laws birthday card. 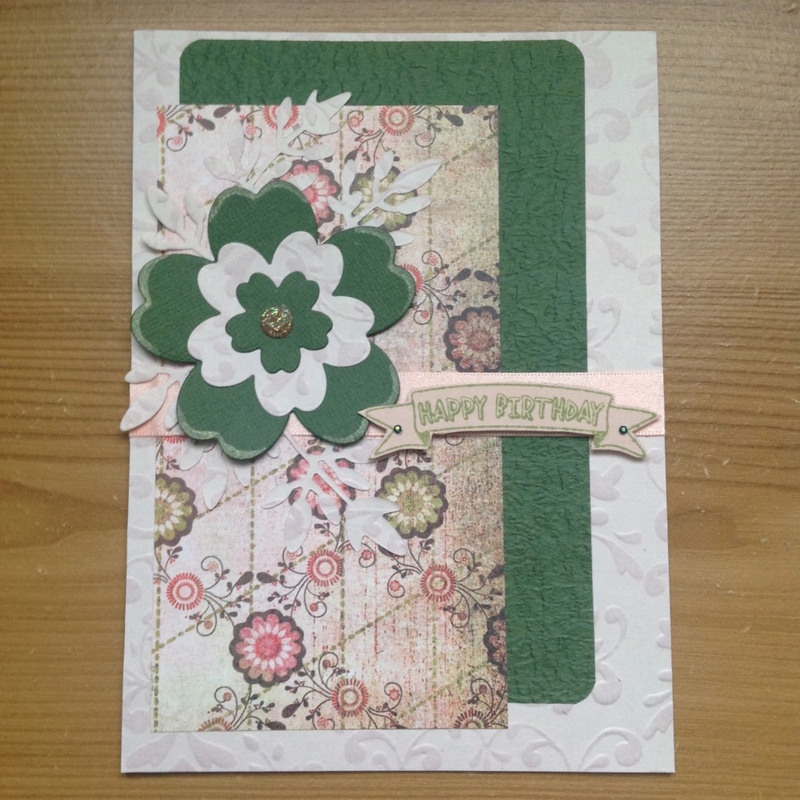 Love the way the flowers 'pop' by using the same green from the mat, Di - great card! Managed to find a Bo Bunny Journaling pad and brads from same set in a draw that I could get to when moving stuff for the windows to be done so went and bought a 12"x12" sheet of white and black, rumaged at friends for the ribbon, No tital or photos yet, but the center green piece is on a card so it will take 2 photo's inside when I can get something sorted. Brads say "Always Laugh, and Always Dream". Oh, well done, Alison - above and beyond the call of duty, I call that! That's smashing Alison, well done on managing to do it with all the chaos around you! Fab card Scatty, I only just realised it was the end of February tomorrow. Fingers crossed I get it done! Well that's another one I haven't done on time but I'll keep it in mind. Good to see them though and a good one to add to later Alison. Made it by a squeak again. 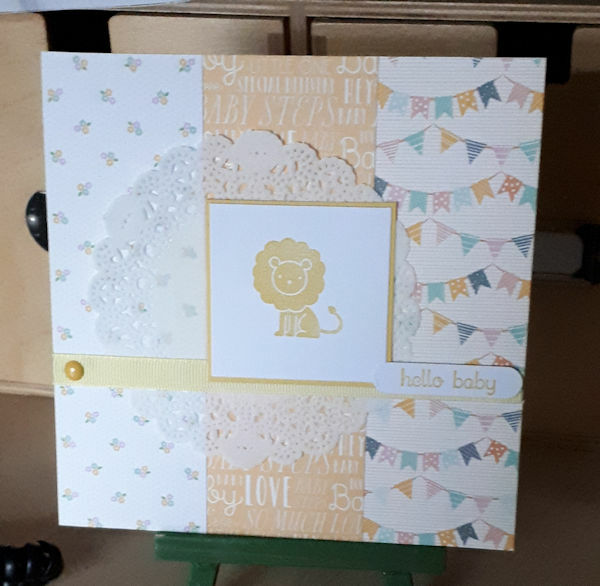 This is a generic baby card, but handy to have one in my very depleted card box. Pretty card, Ruth, and useful to have in your spares box, as you say.